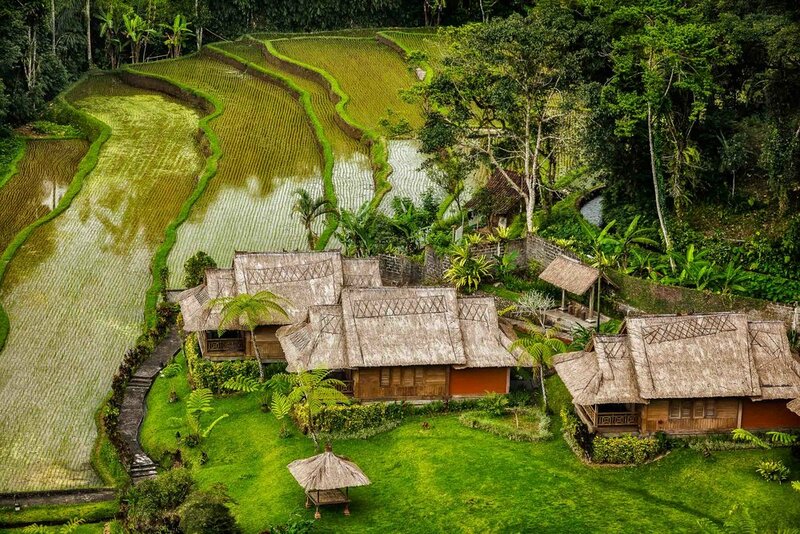 This sublime scene depicts idyllic accommodations, alongside terraced rice paddies, in rural Bali, Indonesia. Accommodation is one of the biggest costs for the traveller and reducing that cost can lead to significant savings. Those savings make it easier to travel for longer and to embark on your adventures more often. The trick is to get the quality and type of accommodation that best suits your needs at a great price. The view from my hotel window in Bangkok, Thailand. More abstract than picturesque. The quality of your accommodation can make a huge difference to your travel experience. A good nights sleep will allow you to greet each and every day fresh and invigorated. Not only can a poor nights sleep sap your strength and enthusiasm, it can make driving in a country with unfamiliar road laws and signage that much more precarious. Believe me, I've had my share of dodgy hotels where you're kept up throughout the night with the doof doof from an in house disco, street noise or overly loud air conditioning systems. Kajane Mua is a low to mid price accommodation option in Ubud, Bali. This photo features one of their delightful free standing bungalows, on the edge of the paddy fields. My first overseas adventures involved staying, for the most part, in hostels. They're a great way to meet other liked minded people and are often down right cheap. I can remember spending just three dollars a night for a bed in a skanky dorm in Hong Kong back in 1988. The place was disgusting and the manager was a thug, but it was where my travels began. What I didn't like about this kind of travel was that so many other backpackers seemed to spend a good part of their day trying to ensure they paid no more than local price. Well, that's fair enough if you're living like a local. The fact is that, if you're eating apple pie or pancakes in places like Kathmandu or Dali, I don't see why you wouldn't pay a bit more for great tasting food when a taste of home is what the jaded traveller seeks. Let's not forget that you're probably eating at restaurants and staying in accommodation where you're not expected to speak the local language. Again, I think a slight premium is not unreasonable. What I don't like is when, as a foreigner, you're expected to pay more for the privilege of staying in the same place, dinning in the same restaurant or walking in the same park as a local. My early travels in China were full of such experiences. I wasn't happy about being treated that way, but I did my best not to let such policies effect my mindset. But that was long ago and, thankfully, that kind of treatment seems largely to have disappeared thanks, I suspect, to the quantity of tourists as much as the economic boom that China has experienced over the years. Fortunately, these days many hostels have private rooms which provide the traveller with a more secure and comfortable environment, while still being a great place to meet up with other folk on the road. I think this is great for the budget traveller, particularly when your room comes with its own shower. While it's possible to secure a decent room at a good price, just by showing up and asking to see what's available, it's a risky business. If it's a busy time of year you'll find it hard to get a room anywhere close to the action without securing your booking earlier. It's just nuts to be going door to door checking out rooms while having to deal with all your luggage. Have trouble balancing your budget? Do yourself a favor and get organized well before you arrive. Doing so will give you a better idea of how much money you have left for food, entertainment and other travel related expenses before you've left home. An overhead street light frames the iconic Q1 Resort and Spa in Surfers Paradise on the Gold Coast in Queensland, Australia. The term Room Rack Rate is the maximum published price of a hotel room. I used to find Agoda particularly useful when traveling in Asia but, overall, have found Booking.com provides me with a huge range of options through a great website and app which I'm able to access on my computer or smartphone. It certainly makes life easy, when alighting from your flight or train, to have your hotel details stored in your mobile phone. Likewise, the Booking.com app makes checking in a breeze. Who doesn't like free accommodation? If staying in a hotel is your preference, get busy collecting points and miles for hotel rooms through credit cards and associated loyalty programs. This is one of the great advantages of a cashless society. With the right card and loyalty program you can collect points overtime and trade those points for a great hotel room. It's not about spending more money, because that makes it harder to travel. It's all about finding ways to be rewarded for the way you spend your money. What's not to like about that? 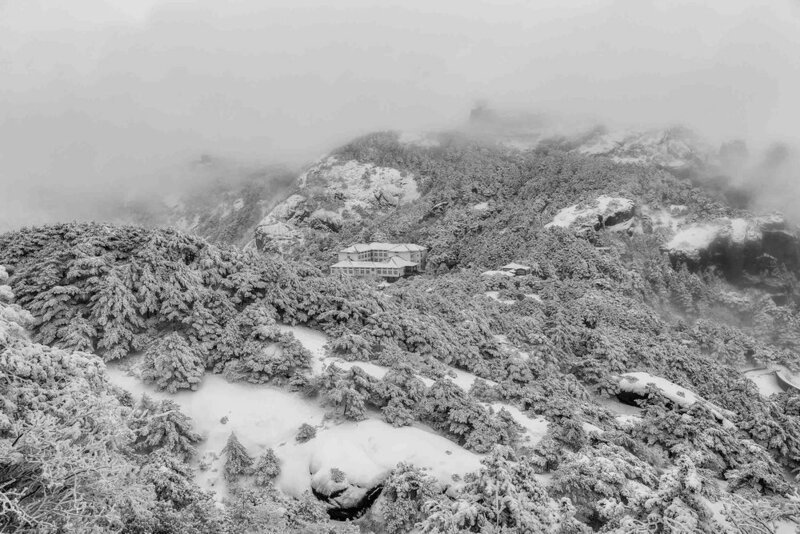 The Bai Yun hotel, nestled amongst snow covered trees and slopes, on the magnificent Huangshan (i.e., Yellow Mountain) in eastern China. Why Not Avoid The Chaos Of The City Centre? You can win, big time, by staying outside of the city centre. Of course you'd want to be careful just how far out you book as it can be costly and inconvenient getting to the action if you're out in the woods. Ideally your accommodation will be comfortable and quiet and situated close to a train line or local bus service that offers frequent and affordable transport into the city centre. That's a much better option than having to dip into your pocket for a $50 taxi fare in some parts of the world. Airbnb has become a massive success and opened up homely accommodation options to travelers all over the world. It's the favored option for many seasoned travels, and is great for those wishing to stay in the one place for an extended period of time. Airbnd allows you to connect with homeowners who rent out one or more rooms in their own homes to folks like you. As well as a comfortable and safe abode you have the opportunity to gather some local knowledge from a resident, often at a fraction of the cost of a regular hotel room. Airbnd is also a great option for small groups as you can rent a whole house, including the kitchen, and stay for an extended period of time in the one location. 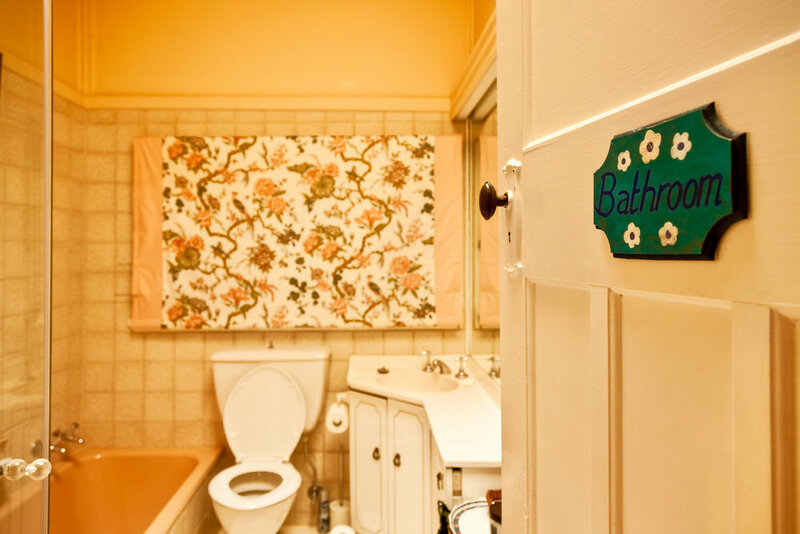 A soft and delicate color scheme adorns this lovely bathroom in a private home in rural Australia. How About You Save Money By House Sitting? Speaking of staying in town for an extended period of time. You might want to consider house sitting. It's a mutually beneficial relationship as it provides you with inexpensive or, perhaps, free accommodation while providing the owner/s of the home with reliable tenants who'll look after their house and pets while they're on the road themselves. There's no need to wax on and wax off here. Couch surfing provides you with a free place to stay and a new friend who can show you around as only a local can. Designed as a form of cultural exchange, and popular with travelers of all ages, couch surfing is a great way for the budget traveller to stay on the road longer. It's worth noting the generosity of those good folk who make their homes and themselves available to assist the budget traveller. Please be sure to treat your host with respect and friendship so that they'll continue to offer their support to other travellers' into the future. It's just another way to pay it back. Hostels, house sitting, couch surfing and Airbnbs are all options that can include access to a kitchen. This is a great way to save money by preparing at least some of your own meals and, by doing so, allow your travel budget to stretch that much further. 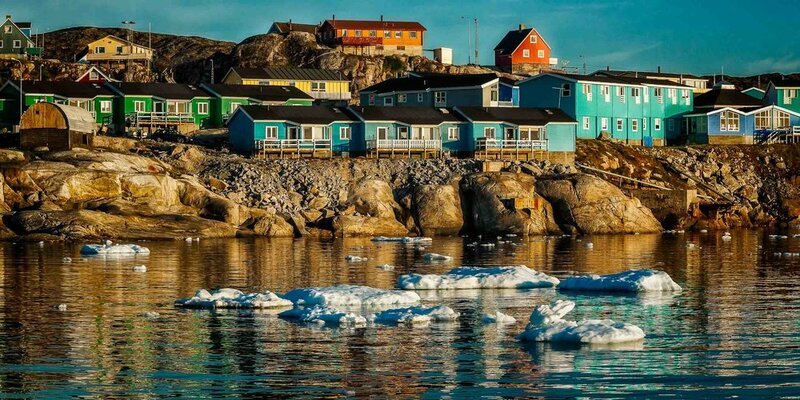 Colorful accommodation overlooking the waters of the Ilulissat Icefjord in Ilulissat, Greenland. What Kind Of Accommodation Suits You Best? Because I'm travelling with expensive camera gear and associated electronic devices dormitory accommodation is not for me. And then there's my snoring. I just don't think it's right to expect folks to put up with snoring when it's coming from someone other than their partner. I'm quite a gregarious person and I love meeting new people. That said, at the end of a busy day on the road, I really appreciate peace and quiet. That means I'm the kind of person who is better suited to having their own room. I'm a travel photographer, which means I travel specifically to make photographs. It's a fantastic experience, to be sure, but it's no holiday. I'm always working when I'm travelling and making images professionally involves a completely different mindset, skillset and level of energy compared to the tourist making the occasional snapshot. While I enjoy staying in a huge and swanky hotel as much as the next person, these days I like to mix things up by varying my accommodation options between large branded hotels; smaller boutique hotels; and home stays. I really appreciate peace and quite and I love the opportunity to learn from and get to know owners/managers and staff alike. For me travel has a lot to do with the people you meet while you're on the road. You may find it worthwhile varying the type of accommodation you choose on your next trip. Mix it up and, if the price is right, treat yourself to some place special every now and again. It's all part of the travel experience.